The LG G Pro 2 is all set to be unveiled at MWC 2014, but the rumors keep pouring in ahead of its official reveal. The latest concerns the new LG flagship's bezel - or lack thereof, to be more accurate. Apparently the G Pro 2 will feature a razor-thin 0.4mm bezel, making its large display look ever larger, according to Korean site FNNews. And a rumor reported by CNET says that screen will measure in at 5.7 inches - slightly smaller than our previous expectation of a full 6 inches, but enormous nonetheless. 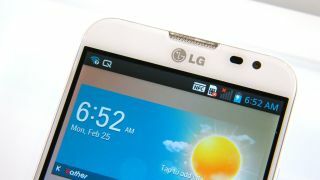 The original LG Optimus G Pro rocked a 5.2-inch screen, but we're expecting significantly more from its successor. Whatever its size, that display will cover over three quarters of the LG G Pro 2's face, if the rumor about the 04.mm bezel pans out. Other expected specs include a Snapdragon 800 processor, 3GB of RAM, and Android 4.4 KitKat. What's not a rumor is that the G Pro 2 will sport a 13-megapixel camera with optical image stabilization and 4K, slow-mo video capabilities. Watch out for the phone's official announcement at Mobile World Congress this month. Find out what TechRadar thought of the LG G2.